DOD 2017 conference program is released. Humans experience a wide array of disasters that generally fall into two categories: natural disasters such as hurricanes, earthquakes, tsunamis, volcanic eruptions, etc. ; and unnatural, or man-made, disasters such as wars, explosions, wildfires, chemical spills, etc. Such disasters wreak havoc and provoke extensive and large-scale devastation, and carry extremely serious financial repercussions for nations, organizations, and individuals. 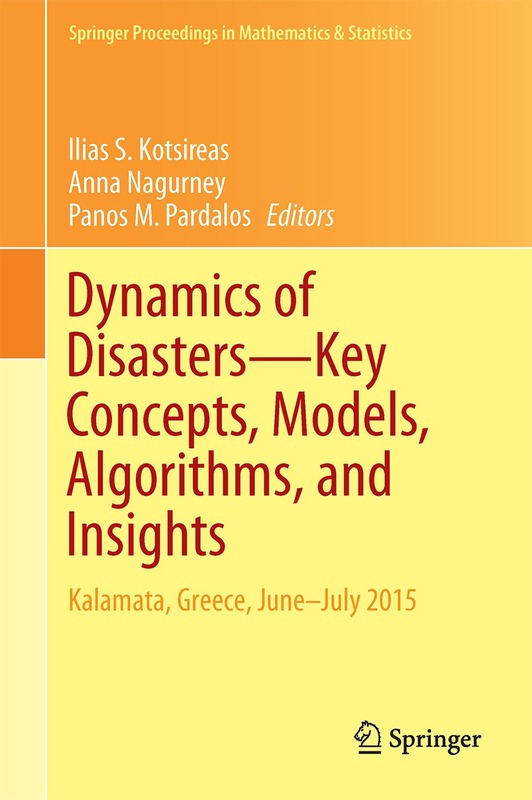 The study of dynamics of disasters is an important and worthwhile endeavour, with huge benefits for everyone. Join us in beautiful Kalamata, Greece on July 5 to 9, 2017, where experts share the latest findings on natural and unnatural disasters. We extend an invitation for those studying topics related to disasters to submit an abstract and paper and everyone to register to attend this fascinating and must-see conference. See the relevant blog posting by Prof. Anna Nagurney! The volume covers topics in the realm of natural and man-made disasters such as war, chemical spills, and wildfires. The conference will be organized at Elite City Resort. Please create your reservation at your earliest convenience. You may travel to Kalamata by train or bus, by renting a car, or by hiring a taxi. There are several new sections of highway between Athens and Kalamata that amount to an approximate 3.5 hour drive. You may travel to Kalamata by a direct airplane flight. During the summer there are several direct charter flights between Kalamata and major European cities such as Paris, Vienna, Berlin, etc. A taxi ride from the airport to the conference venue will take approximately 20 minutes and cost €20. For tourism information on Kalamata, we recommend you review the Web pages of Visit Greece and Kalamata's Traveller Guide and Kalamata (IN). (1) The first excursion will be at the impressive Ancient Messini archeological site. The site is one of the 14 sites in Greece, currently on Unesco's tentative list for insciption on the World Heritage list. There are currently 18 sites in Greece, on Unesco's World Heritage list. Five of them are located in the Peloponnese. (2) The second excursion will be at the world-famous Diros Caves, that feature a unique 1.6 km subterranean river boat ride. Participants of the conference that require visas in order to travel to Greece are kindly asked to contact the conference organizers to solicit an official invitation letter. Note that citizens of European Union countires do not require a visa to enter Greece, and will only require a valid passport or for Schengen countires, an identification card. Citizens of Australia, Canada, Isreael, Japan, New Zealand, Iceland, Switzerland, and USA do not require a visa in order to enter Greece for a period of less than 3 months. Citizens of countries other than the ones mentioned should contact their nearest Greek Consulate or Embassy. Please make sure that you deal with these matters as early as possible, in case you encounter unexpected processing delays and difficulties. We extend an invitation for those studying topics related to disasters to submit an abstract and paper by contacting the conference organizers. Abstracts and papers are to be typeset in Word or LaTeX and submitted as PDF files. A Springer proceedings volume is planned, containing papers presented at the conference. The conference registration fee includes access to all presentations, coffee and snacks during breaks, the conference banquet, the two conference excursions, and a copy of the Springer volume of proceedings. Please use "YourFirstName, YourLastName, DOD 2017 Registration Fee by Western Union Money Transfer" as the subject line of your e-mail. Please include any special requests that you might have, (e.g. dietetary restrictions, invitation letter for visa issuance) in your e-mail, if applicable. Late conference registration may also be purchased at the conference (cash only). A link to the Elite City Resort on-line secure registration system is now available. Please book your room at the Elite City Resort as early as possible, in order to receive the conference rate. Early July is a very busy tourist season in Kalamata and the surrounding region.